We've said it before and we will say it again: there's nothing like summer sleep away camp. For so many reasons, we wish we could do it all over again. To be back at camp and have our days filled with activities like soccer, ropes course, arts and crafts, swimming and dodge ball or to have our nights filled with evening activities, a camp fire and the anticipation of summer Olympics (color war! ), we would love to relive it all over again. The joy and independence of camp as a pre-teen or teen is unparalleled. We particularly adore the camp calling cards, which are perfect to send to your camper towards the end of the summer. 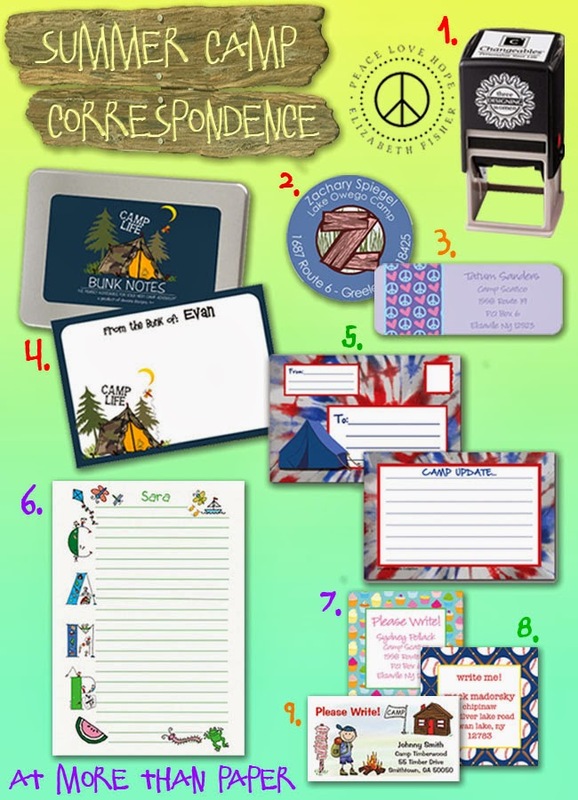 Your camper can pass them out to their bunk mates and other friends to encourage letter writing, emailing, texting, Instagraming (whatever these kids do these days to correspond!) after the summer is over. Or hand them out just before they leave to ensure they receive lots of letters at camp this summer! Find all these great products here: 1) Three Designing Women Personalized Address Stamp 2) Address Label (round) by Namedoodles) 3) Address Label (rectangle) by iDesign + Co 4) Bunk notes gift set by Devora Designs 5) Personalized note cards and matching envelopes in Tie Dye by Bonnie Marcus Colleciton 6) Personalized Stationery Sheets by Just Mishpucha 7) Calling Cards (Cupcake) by iDesign + Co. 8) Calling Cards (Baseball) by iDesign + Co. 9. Calling Cards by Pen at Hand.